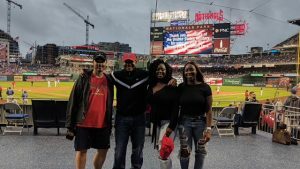 My dad got to enjoy a couple of days off after spending a week on the road to kick off our 2018 “All32in17” mission. My wife & I immediately put him to work & has him watch the kids while we were at work. But my dad always enjoys spending time with X & Q and they love their G-Pa! 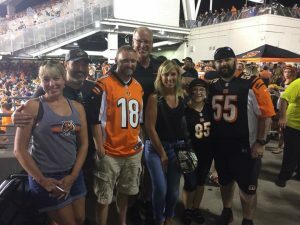 He was back on the road again early Thursday morning to host warriors at the Thursday night Bengals game! Upon arrival at the restaurant, Marine Cpl Josh Basarab and his daughter Katlyn were there waiting for my dad. 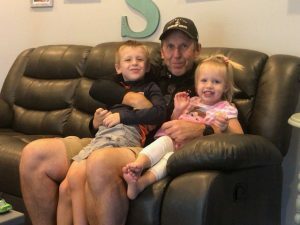 Josh & his family are from the east coast & flew out early to our run Hurricane Florence. Unfortunately our other guests for the night could not make it to dinner, but My dad enjoyed getting to know Josh & his daughter over a delicious meal thanks to our friends at Moerleins! 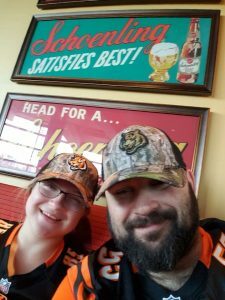 Josh and his daughter are Die Hard Bengals fans! 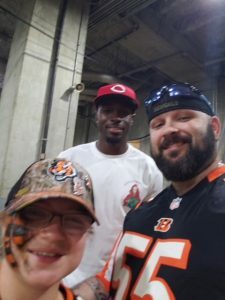 Going to a game in Cincinnati has been a dream for them & it’s an honor to help make this dream come true for them! 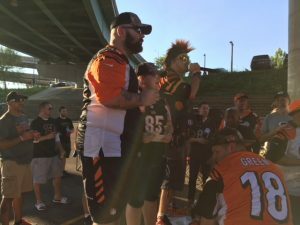 After Dinner, the group made their way over to the Bengals ultimate tailgate, hosted by the Bengal Bomb Squad! 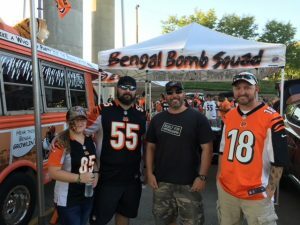 The Bengal Bomb squad is filled with some of the Bengals biggest fans! 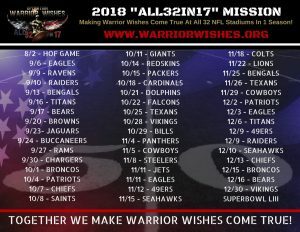 Their squad has been hosting & helping make wishes come true since we started our mission in 2012! We cannot thank them enough for their support throughout the years!!! 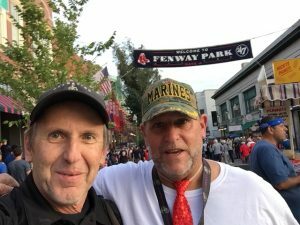 They met up with Marines Mike & Jeremy at the tailgate. 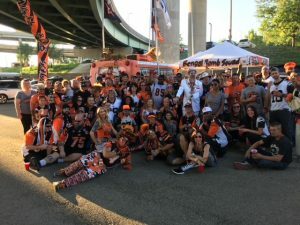 Today was a special Tailgate – it was “Be Like Katie” Night. One game each year they honor a young lady who frequented their tailgate, who passed away a couple years ago. 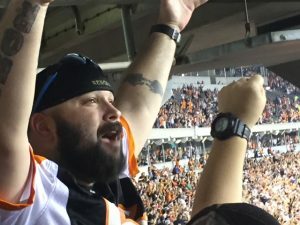 They have a beer pong tournament in her honor and they donate proceeds to Our mission. Ironically- or maybe not – Katie’s mom Terri has won it 2 straight years! 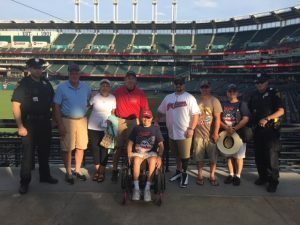 Before heading inside the stadium, “Big John” & the Bomb Squad took an awesome group photo, introduced and raised a toast to the warriors! 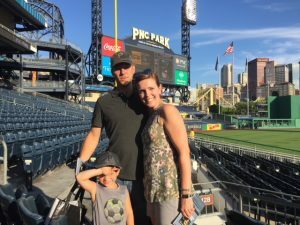 It’s one of our favorite moment each time we come to Cincinnati. The Bomb Squad truly appreciates these warriors for their service & sacrifices! 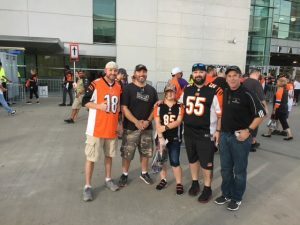 The group snapped a nice picture in front of the stadium before heading inside to watch the Bengals home opener! 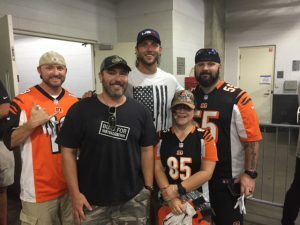 Bengals tight end, Tyler Eifert, once again provided great seats to the warriors for the game. 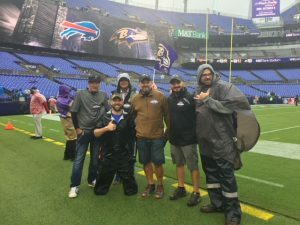 However, the warriors didn’t spend much time “sitting” in them as they were primarily on their feet cheering on the team! The Bengals or should I say Andy Dalton & AJ Green dominated the first quarter! 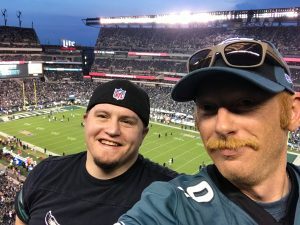 They connected 3 times for 3 Touchdowns & jumped out to an early 21-0 lead! The Ravens did their best to get back in the game, but ended up falling short losing 34-23. 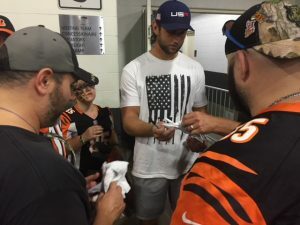 About halfway thru the game, Tyler Eifert’s dad, Greg, dropped by with a little surprise for the warriors & presented each of them with post game passes to meet the players after the game! Needless to say, the group was beyond excited for the opportunity. 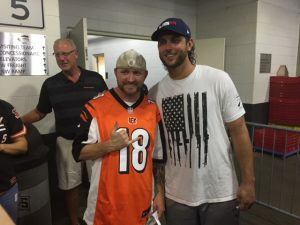 After the big win, Tyler came out and thanked the warriors for their service & sacrifices. He also gave each of them game used gloves! And of course he signed some autographs & took some pictures. 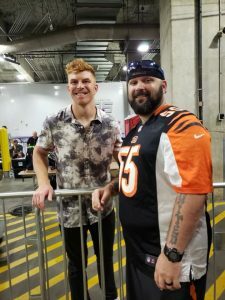 They also met he stars of the game, AJ Green & Andy Dalton! We would like to thank Tyler once again for his continued support! 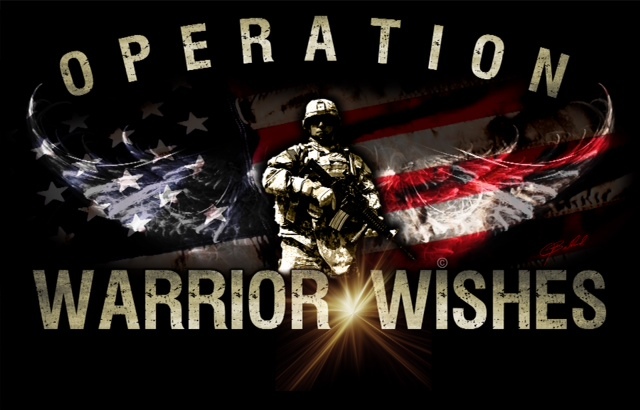 You truly help make Wishes come true! 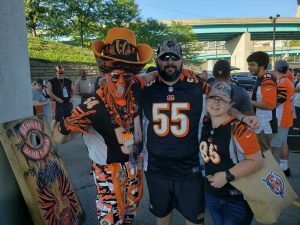 We also want to thank Moerleins for providing the pregame meal, New Era for providing Bengals caps & special thanks to the Bengal Bomb Squad! 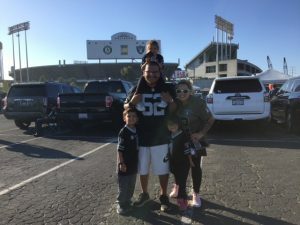 Your tailgate is one of the best! Most. 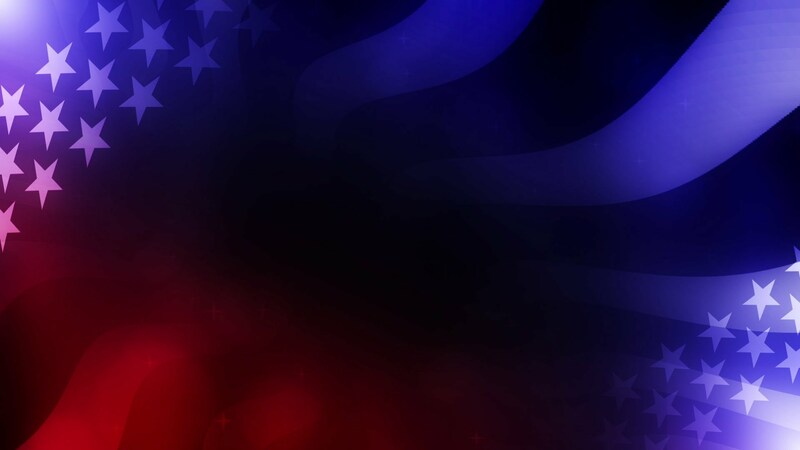 Importantly, we want to thank Marines Joshua Basarab, Mike Coffey and Jeremy Ainsworth for your selfless service & sacrifices! My dad plans to spend the night hanging out at the casino, not to gamble, but to just hang out for the night before catching his bus tomorrow back to Chicago. 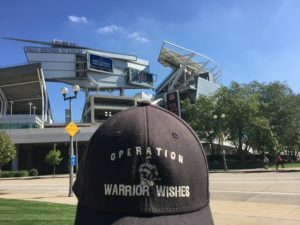 He will be back in action this weekend in Nashville making Wishes come true at the Titans game! Stay tuned for all of the details! 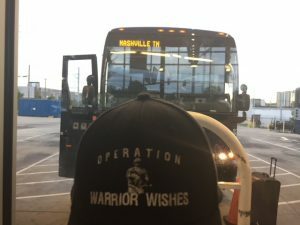 Game 3 – Warrior Wishes Come True In Oakland!